WHAT'S INSIDE THE "Join My Prayers" MEMBERS' AREA? 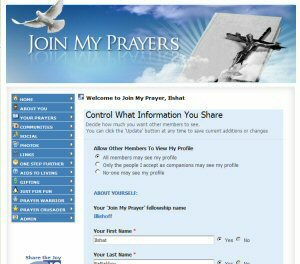 What we've tried to achieve at Join My Prayers, is an online environment where Christians can make contact with fellow Christians and where believers can actively help other people by beseeching God to grant their prayers. So we've developed something akin to a Facebook environment, but totally focused on our Christian "niche". You totally control what information you want to display about yourself. You can choose to display nothing or you can tell fellow members all about yourself. The choice is entirely yours. 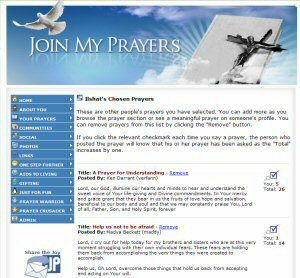 > Posting your prayers is a very simple process using a web form. You can edit them at any time if necessary. Prayers that you no longer feel are relevant can be deleted if you choose. Your personal prayer selection is stored for you so you can quickly and easily access it. You can search the member list in many different ways. As you do so, you will discover fellow pilgrims with similar wishes to yours who you may want to invite as a prayer companion (a little like 'friends' in Facebook). You can view your companions at any time and you can accept or reject invitations from other members to become your companion. Pictures have the capacity to stir the heart and we recognise that many people would love to share that inspiration with others. 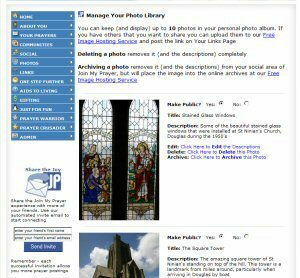 We enable all members to display up to ten photos in their personal profile and, to ensure that the image sharing continues, archive older pictures into what we hope will eventually become the internet's largest spiritual image library. When you find another website doing God's work, don't let the opportunity pass by - copy the URL and paste it into your link library at 'Join My Prayers'. Sharing links with others helps us all reach a better place. Candles as Christian symbols represent the light of God or the light of Jesus Christ. Candles are used in processions, at the altar and are lit as a sign of remembrance or to accompany prayer. 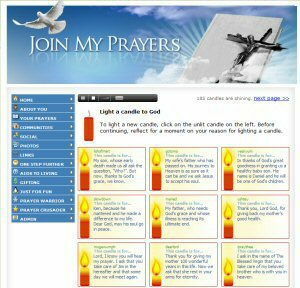 Members can light a candle of thanks or in remembrance or simply to begin or end the day by the sacred ritual of lighting a candle on this website. Marie is our resident counsellor. As well as being hugely experienced in counselling, she is a medical doctor with many years experience. Members can pose their questions (in total anonymity) and Marie will do her best to respond in her column. Though Marie will answer questions expressing her opinion, we understand that other people may hold different views, so we encourage comments from other members of our Christian fellowship. You can share your music experience with other members by rating the songs, adding comments and by picking your favorites. Hand-picked Community Leaders provide fellowship to those of similar spiritual leanings, and thought-provoking content for those who are interested. Members can comment on all posts, and are encouraged to do so. Typical example - not actual. 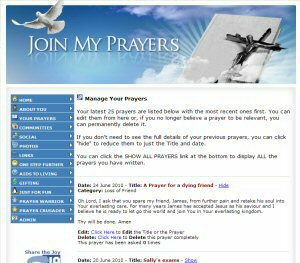 For added security, the member's area of 'Join My Prayers' has a fully-integrated messaging system so that members can talk to each other without revealing their true email addresses. Inter-member contact (or contact with the site administrators) is by simple web forms and members are notified when there's a message waiting for them. Personal Consultations with our own Prayer Crusaders. Ask any question and get impartial advice by return. A small selection of Christian Gifts. A regularly update selection to suit all the family on those special occasions. To make you smile. Here we offer a few carefully selected jokes with a religious flavor. Nothing offensive and nothing to take too seriously! Easy to find your way around. Our navigation menu is simple to use and grouped intuitively. Finding what you need is simple and straightforward. Create a memoriam web page. 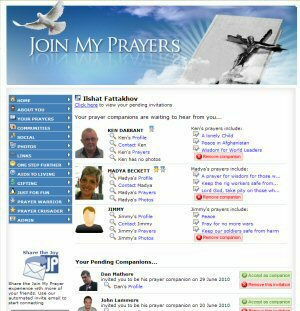 Leave a permanent online memorial for your deceased friends or relatives. Just three easy steps. Prayer Warriors. 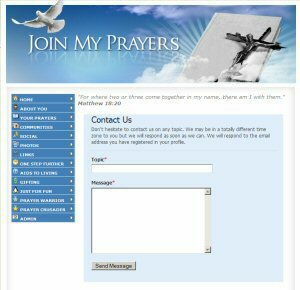 For members who feel they can promote JoinMyPrayers.com to other Christians, we offer the benefits of Prayer Warrior status. Christian Gifting. Discover the joys and pleasures of Christian Gifting as discussed in The Bible. We'll show you how. The 1-2-3-4 model. Read about our 1-2-3-4 model and follow our example to enrich the lives of others. 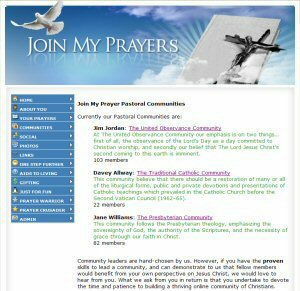 In fact, the member's area encompasses all that a prayer-oriented community needs to flourish - shared prayers, shared values and shared information. So make the decision right NOW to join us and devote more of your time to God's purpose. � 2009 - 2019 Ethical Communications.